Iron ore cargoes from Australia’s Port Hedland, the world’s largest bulk export terminal, jumped to an all-time high of almost half a billion metric tons in 2017, offering fresh evidence of burgeoning global supply at a time when bearish forecasts for the commodity are stacking up. 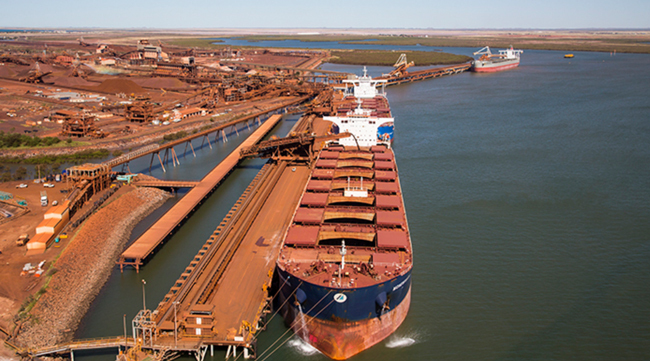 Exports from the port, which handles material for BHP Billiton Ltd., Fortescue Metals Group Ltd. and Roy Hill Holdings Pty, climbed 5 percent to 46.1 million tons in December to set a monthly record, according to Pilbara Ports Authority figures on Tuesday. For all of 2017, shipments were 497 million tons, up from 479 million in 2016, according to Bloomberg calculations. While iron ore rallied into a bull market last month amid speculation demand will remain robust, especially after China eases steel output curbs imposed this winter, there’s been a flurry of forecasts that gains aren’t sustainable. “Iron ore’s latest advance indicates expectations for a springtime recovery in steel production,” Everbright Futures Co. said in a note, referring to the expected demand revival when the curbs end. “Even though port inventories in China are very high, prices can probably be sustained for a while. Port Hedland is the main gateway to Australia’s Pilbara, center of the nation’s mammoth iron ore industry, the world’s largest. Roy Hill is seeking to boost annual exports to 60 million tons from 55 million, The Australian newspaper reported, citing documents submitted to the state government. Cargoes from Port Hedland to China were a record 39.1 million tons in December 2017, compared with 37.4 million a year earlier, according to the authority. That’s helped to boost port stockpiles in China to unprecedented levels of more than 150 million tons, according to Shanghai Steelhome E-Commerce Co. In its resources outlook, the Australian government said free-on-board prices will average $52.60 this year and $48.80 in 2019. Exports from the top shipper and Brazil will increase to 1.32 billion tons next year from 1.22 billion in 2017, the Department of Industry, Innovation and Science estimates.